After use, they can simply be thrown away. The problem with this, however, is that plastic items are one of the world’s greatest polluters. Oceans are becoming so filled with plastic that it is estimated that there will be more plastic than marine life in the oceans by 2050. Plastic is also overflowing our landfill sites at an alarming rate. For this reason, it is advisable to take environmental considerations and reusability into account when purchasing laboratory equipment of all kinds. Obviously, plastic is sometimes unavoidable, but researchers are urged to ensure that plastic equipment and tools that are designed to be used once and then disposed of are cleaned and then included in an appropriate recycling program. In the past, glass was the only material that researchers used when transferring bacteria and cells to a growing medium. These days, glass is not the only material from which spreaders are made. In fact, there is an almost bewildering number of spreaders available from a vast number of manufacturers out there. One needs to have an idea of what sorts of spreaders are available, as well as their sizes, materials, and colors. One of the main qualities that a good spreader should possess is extremely smooth, rounded surfaces free of rough edges. This is important to allow for even distribution of samples across the surface of the petri dish. A smooth spreader is also essential to prevent the medium (such as agar) from being gouged or cut into. Destroying the physical integrity of the growing medium can seriously jeopardize any attempt at growing a good cell or bacterial culture. There are various shapes of spreader available, each with their own benefits and special uses. The three main shapes are T-shaped, L-shaped, and triangular. T-shaped spreaders make the spreading and dispersal of liquids across the surface of agar plates very easy. They are used, for example, to perform bacterial CFU plate counts on liquid samples such as urine, milk, and water. The T-shape allows for the application of even pressure across the length of the bar that is in contact with the agar surface. L-shaped spreaders, which often have an up-turned tip, also allow for easy spreading of the sample: apply the sample on the spreader to the agar dish, then turn the dish all the way around until you have distributed the material smoothly and evenly across the dish. Plastic spreaders are supplied in a sterile condition and individually packed so that there is no need for sterilization. They are flexible, durable and hardy, and pose none of the safety hazards that glass equipment does. Another advantage of plastic spreaders is that they come in a number of colors. This allows the researcher to see how smoothly and evenly the sample is being spread across the agar surface. If you are using a glass or metal spreader, before each use, sterilize it thoroughly. This is done by first submerging the spreader in ethanol or alcohol. Once this step has been taken, place the spreader into the flame of a Bunsen burner to destroy any microbes that might be clinging to the spreader. Plastic spreaders come ready-sterilized in individual packets to prevent contamination. They can be disposed of once used, ideally first thoroughly cleaned and then taken for recycling. To use a spreader, first, choose the appropriate shape for your sample. Different shapes are suited to different applications, but many researchers have firm personal favorites that they use again and again. Then drop your bacteria or cells at the center of the agar dish. Place the spreader on top of the dish and swirl it around to distribute the sample cells while applying minimal pressure. After each use of a metal or glass spreader, place it back into ethanol or alcohol to clean it and prevent contamination from unwanted particles. 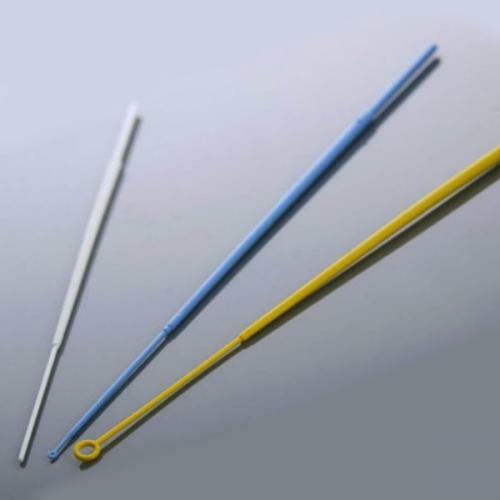 Plastic spreaders are usually disposable, so do not need to be sterilized.